The CNC-controlled Foilpuller from Foilpuller GmbH automates the film-removal process for sheetmetal used in white-goods production, eliminating tedious manual labor and delivering operating-cost savings to 97 percent as compared to standard vacuum generators. Featuring rapid cycle times of 30 to 45 sec., the Foilpuller employs Fipa (Cary, NC) flat vacuum cups and compact ejectors to apply suction to single pieces of sheetmetal in a designated stack at the pick-up site. The vacuum cups prevent wobbling, while a vacuum shuttle delivers the sheet to a worktable where a cutting wheel lightly scores the protective film on the surface of the sheet. Through precisely controlled cutting, the wheel only makes incisions where film must be removed to allow for mounting fittings, hinges, cutouts and welding work, leaving the rest of the protective film intact. 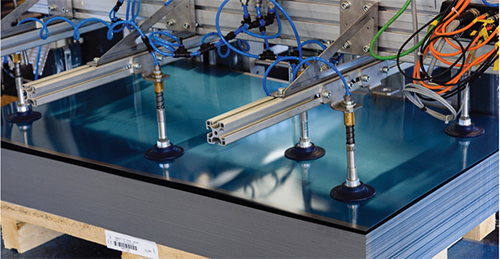 A scraper then removes the scored film to reveal a residue-free surface before the Fipa gripper system places the sheet in a second designated stack for further processing. Fipa’s SM-F-series flat vacuum cups feature a flexible sealing lip for optimal, nonslip contact with sheetmetal, and are suitable for almost all standard metal surfaces, including flat or textured stainless steel, varnished steel metal, coated plates and printed film. Fipa’s EMA-series compact ejectors combine a pressure regulating, energy-saving function with an electronic air-saving function to achieve high operational efficiency for the Foilpuller, according to Fipa officials.